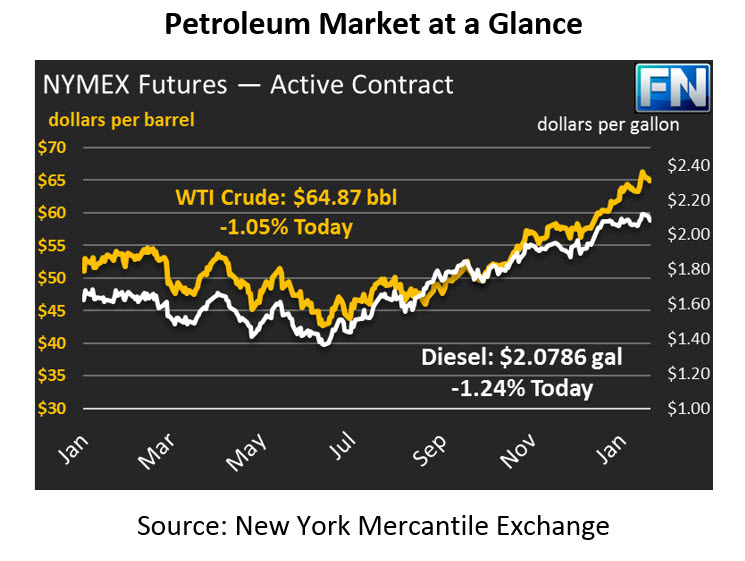 Oil prices fell yesterday as some market participants took their profits and left the market. The slowdown is not necessarily a reversal; it could be merely a pause in crude’s run higher. After falling yesterday, prices are continuing to trend lower. So far, WTI crude oil is down 69 cents (1.1%), trading at $64.87. Refined fuels are following crude prices lower. Yesterday, diesel ended with nearly 3.5 cent losses, while gasoline managed to keep losses to just 0.8 cents. Today, the two are falling in unison, both down 1.2% this morning. Diesel prices are currently $2.0786, a loss of 2.6 cents. Gasoline prices are trading at $1.9122, down 2.3 cents. In the downstream oil sector, markets are closely watching the Northeast. Philadelphia Energy Solutions, the largest refinery in the Northeast, filed for bankruptcy last week, citing RINs obligations as a major cause. PES is obligated to retire 260 million RINS, which would cost $160 million dollars at current RINs prices. RINs, or Renewable Identification Numbers, are created by biofuel producers, and refineries must purchase and retire a certain number to meet environmental requirements. The EPA uses those RINs to ensure enough biofuels are being produced and blended to meet the Renewable Fuels Standard (RFS). Yesterday, courts overruled PES’s request to shed its RINs requirement. The court noted that PES could have offset its costs by investing in biofuel production or rack blending practices. Other poor investments PES had undertaken also played a factor. Small refineries throughout the country were watching the decision, looking for a way to avoid their own RINs obligations – this court ruling will likely deter them from attempting similar actions in the future. Yesterday, ExxonMobil’s CEO noted that the company planned to spend $50 billion expanding its business in the U.S., thanks to tax reforms and high crude prices. This comes as many banks raise their price forecast for crude – last week, J.P. Morgan raised their 2018 Brent crude forecast to $70/bbl, a notable $10 increase from their previous forecast. Recent market forecast changes generally show strong demand boosting prices in the first half of the year, followed by robust supply flooding the market in the back half of the year. Surely announcements like Exxon’s play into these forecasts, as the rush to invest in oil production now could bring supply excess in the coming year.